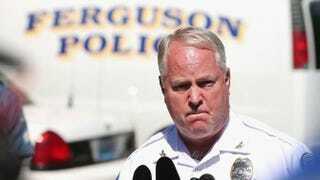 Thomas Jackson, chief of the Ferguson, Mo., Police Department, will resign Wednesday, Reuters is reporting via Fox News. The news comes nearly a week after a Justice Department investigation found that the Ferguson police force harbored racial biases and acted on them, much to the detriment of the city’s African-American community. The DOJ investigation was prompted by the fatal shooting of an unarmed teenager, Michael Brown, by a white police officer in August. CNN is reporting that Jackson is willing to step down, but that first he wanted to make sure that the Ferguson police force would not be dissolved. According to Reuters, Jackson’s concerns stem from comments Attorney General Eric Holder made last week after the findings from the DOJ investigation were released. Holder said that the Justice Department has the power to dismantle or completely reform Ferguson’s Police Department. Pink slips are flying in Ferguson as a result of the findings from the DOJ’s investigation. Three employees in the Ferguson police force were fired for sending “offensive emails” that the DOJ investigation discovered. Ferguson City Manager John Shaw resigned Tuesday, and city Municipal Judge Ronal Brockmeyer stepped down Monday.